Remember how exciting it was to get the new Goosebumps books? Maybe you got them from the library, maybe you'd buy the newest one as soon as it came out with babysitting money (no way you're gonna let your classmates give you spoilers) wither way, there's nothing like grabbing that shiny chapter book with the gruesome illustrations with bubbly textures on the cover. Everyone has their favorite. Maybe the story about the Dummies kept you up at night. Or perhaps you had cursed Mummy's on the mind. 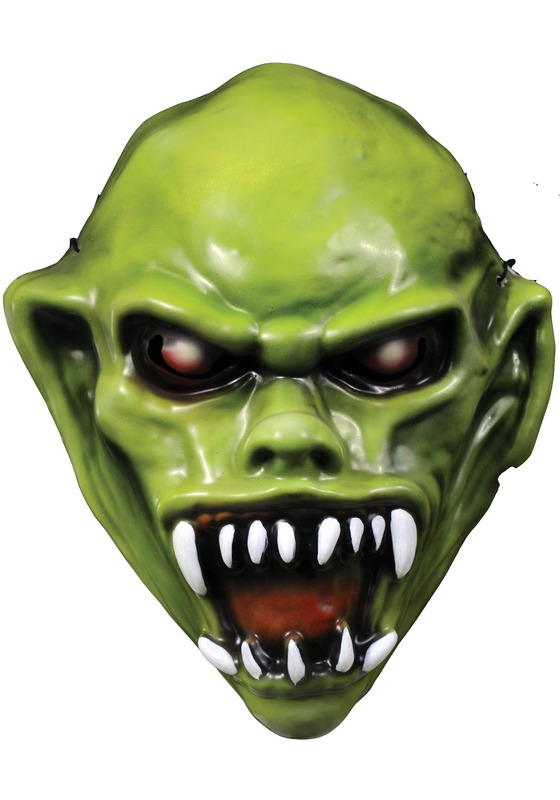 But if you were like most kids, the haunted mask really stuck with you throughout the years. That's one story that'll make you steer clear of trying on mysterious masks for life! While you won't be possessed by an angry mad inventor spirit when you put this mask on, you will look just like the illustration from the first Haunted mask book. Goosebumps fans everywhere will be completely frightened when they see their childhood fear come to life. Simply snap the stiff plastic over your face with an elastic band and you'll be ready to go. Now you're ready to live your favorite nightmare as a child! Head out solo or pair up with Slappy the Dummy to bring all those bumpy paperback covers into reality!